SAS Curriculum Pathways has launched a no-cost app that uses Sphero robots to teach kids the fundamentals of computer programming. With one iPad and a single Sphero robot, a teacher can conduct a lesson for the entire class that teaches coding basics. 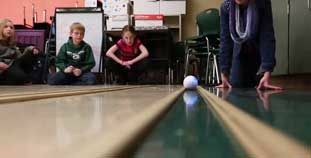 A Sphero is an app-enabled robotic ball that students control with an iPad®. Students prepare programs together using printed paper blocks. The blocks represent pieces of code, which students “snap” together in a certain order to create programs to control the Sphero. They then scan the assembled blocks using the app and run the program, which the Sphero executes. Set Sphero’s color to blue. Set Sphero’s color to rainbow. CodeSnaps is available for iPad through the App Store. Interested users can also download the app from the CodeSnaps website, where they can view tutorials and print code blocks.